Welcome to the Last Chance Nordic Ski Club website. 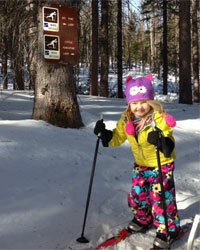 Helena, Montana’s LCNSC grooms Nordic trails on MacDonald Pass and the Bill Roberts Golf Course, and supports programs for Master and Youth skiers. Summarized below are the latest trail conditions reports, as well as news about Club activities and other cross country skiing information. It’s a calm, sunny morning on Mac Pass! Temperatures are around freezing. I took the ginzu a couple of laps around the core trails. Conditions were icy near the parking lot, but steadily improve as you get further back. There is some great snow on the upper Microwave Road. There is good corduroy on the skate lane now at Mac Pass. Aaron did a great job grooming it with the ginzu. It probably would be best to start skiing soon, before the snow softens. Left the classic track, which is holding up. It’s foggy, calm, and in the 30s. Awesome day for spring skiing! Groomed skate lane this morning. It’s good skiing this morning and should be most of the day. See article in March 6 edition of the Helena Independent Record.